One coat looks dark and rich, two coats is incredibly glossy! Do you want your tires to look incredibly glossy and bold? If yes, you must try the Poorboy's World Bold 'n Bright Gel! This premium tire gel was created to take your tires to the next level. Apply just one coating for an extremely dark and glossy appearance. The gel based formula spreads evenly and thoroughly so you get an amazing shine every time. It makes the tires look like new again with an even bolder appearance. It is the perfect finishing touch to any detail that really draws your eye to your vehicle. This formula will not sling as it dries fully within minutes. You can apply it with any foam applicator or with a brush. Either way the appearance is exceptional and you'll love the results. 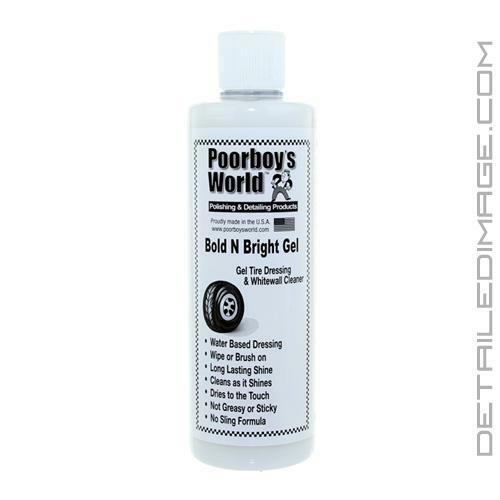 Try the Poorboy's World Bold 'n Bright Gel formula to see what you are missing! Bold N Bright Gel is a unique dressing for a clean, bold shine, with a very easy gel application. Bold N Bright Gel is great for tires and soft rubber. Our water-based formula will dry to the touch, when wiped on tires or rubber, in just a few minutes. It also helps to condition and prevent dry rot of your tires with our UV A&B absorbers. Use in the engine compartment on all rubber and plastic parts for shows or just a great look. Directions: Apply Bold N Bright Gel on a foam applicator, then wipe onto tires or soft rubber. If using on whitewalls or RWL, apply to tire and then use a soft bristle tire brush to lightly scrub. Wipe whitewalls or RWL with a clean cotton towel. My new favorite! It leaves such a great deep fresh black tire finish and not the super shiny, sling happy other stuff. I have been getting tons of questions at shows about which product I used for my tires. You will love the way your tires look and won't need to wipe your fenders or quarters down after you take it for a drive. This is some great product to use if you want a nice black finish that is not over shiny.